A dark, cozy restaurant filled with delicious Italian for those of us who cannot afford to go to the Tapastree every night. 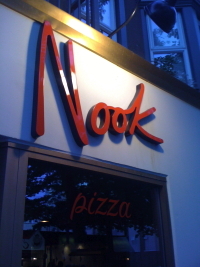 I used to pass by Nook thinking it was just another pizza joint jammed into Denman street; however, I was sorely mistaken. Nook is more upscale than I thought it would be. No greasy pie by the slice to be found here. Nook is a dimly lit restaurant, comfortable and relaxing, with a delicious menu that is tantalizing in its simplicity. But the twist that really sets Nook apart from every other decent restaurant you walk past is that it is actually affordable! Hurray! Maybe there is a silver lining to the economic downturn after all. This tiny closet of a restaurant seats only about 30 and on weekend nights there is usually a line pouring out onto the street. But unlike Stepho’s – it makes sense here. The service is above average – with staff that are an experienced team comprised of smiles, answers and attentive speed. The food is superb and the priciest items top out at about $15. The menu is a good Italian core of pizza and pasta with some antipasto and crostini thrown in for good measure. The menu is limited but there is always a specials board which looks great each night. Really, how could anyone turn down a lasagna with a pesto béchamel? The menu is a teeny sliver of paper – mainly because it isn’t ultra descriptive – but after the first bite you’ll know they’re only using top quality ingredients. For starters, they either brush or douse everything with olive oil. No, not just olive oil, Nook uses Golden Eleni olive oil ($30 per 0.5 l bottle). This is a great start and the rest of the ingredients used follow suit: organic heirloom tomatoes, high end pastas, and so forth. Nook’s pizza is a thin crust that rivals the best you’ve ever eaten. We ordered the italian sausage with chilies and sweet onions. For the price, I assumed it would be a single person serving – but nope, it’s a whole pizza – certainly enough for two. Going back, we had to get the ricotta pizza. Which, for the record, is one of the best pizzas I’ve ever had in my whole life. We also tried the delectable gnocchi with baby meatballs, which again, is a decent portion of savory deliciousness. The meatballs are so good – on our next outing I ordered an antipasto dish of just the meatballs ($9). I would have loved to try the tiramisu – but I was too darn full. I KNOW! I was too full to have any tiramisu. The first time. The next time I planned accordingly so I could have the tiramisu, in addition to trying 2 other amazing desserts ($6-8). The wine list is decent if you happen to love Italian reds. If, like some of us, you think Italian wine tastes like dirt – I whole heartedly recommend you order a glass of sparkling prosecco or get a bellini (no, not that weird slushie thing they serve you at Moxie’s – but Prosecco with peach puree). Other drink options include Italian beers and, of course, San Pellegrino. Overall, I would totally recommend Nook – the only downfall is it’s so busy and tiny and they don’t take reservations. I hope you like waiting outside in the rain. What’s that? You don’t want to wait outside in the rain? Okay – then you should probably go at 5.30pm on a Tuesday. Bonus: The owner/chef is the same that opened Tapastree around the corner. This should instill confidence. Extra Bonus: at the bottom of the menu is printed “all products may contain pork, tasty, tasty pork.”. Anti-bonus: they are NOT open for lunch. They don’t really have hours posted – though they seem to open around 5 pm each day. But whether they are open on Sundays seems to be up for debate. This duo creates a simple sound but has an energy that cannot be ignored. This entry was posted in Food, Music, Restaurant Reviews and tagged denman, italian, nook, pasta, pizza, restaurant, robson, tapastree, Vancouver, west end. Bookmark the permalink.